Emerald River Villa The 4 bedrooms villa of 780 m2 is composed of 4 different 2 storey buildings linked on the second floor by a large terrace and pathway bridges. 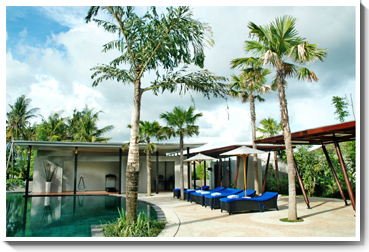 The 150 m2 overflow swimming pool surrounded by a gym room, the terrace and the open space living room is overlooking the rest of the property and gives an extraordinary feeling of luxury so well integrated in the true Bali. The 2000 m2 land with numerous tropical trees including a huge mango tree is sloping down until the river 200 meters from the beach. The villa has been designed by the very reputable Yoka Sara who has expressed a modern architecture but has kept the Balinese touch with traditional material such as wood roof, terrazzo, merbau floor. The furniture and equipment are providing an international high speed connection, Bose audio system, LCD flat screen television. The entrance of the villa is opening directly on a large pebble washed terrace planted of palm trees, a gym on the right side, a very comfortable open space living room all surrounding an amazing 150 m2 swimming pool and 25 m2 Jacuzzi covered by Indian slated stones giving different colours in connection with the luminosity of the day. From the living room a wood path bridge gives access to the air conditioned dinning room including a fully equipped pantry and to the master bedroom hidden by a fabulous mango tree. The master bedroom equipped with ducting air conditioning, TV, DVD, sound system, features a king size bed with mosquito net a separate office space which can be rearranged into an extra junior room, a dressing, and an en suite bathroom. The bathroom features two basins, a shower, a separate toilet, a make up table and a huge out door terrazo bath tub situated on a secluded and private terrace. The staff area including storage laundry and kitchen is situaded under the gym. All the bedrooms floor and large sliding windows are made with merbau. All rooms are nicely decorated mainly with Balinese arts. The garden is manicured with grass lawn, different type of tropical trees, plants and flowers. At your full service, 1 manager is supervising 15 staffs, including 1 chef, 4 housekeepers, 2 share gardeners and swiming pool attendant, 1 share maintenance boy and 6 share 24 hours security guards.